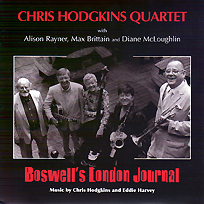 Chris’ most ambitious project to date is the album Boswell’s London Journal, a suite of 15 tunes co-composed by Chris Hodgkins and Eddie Harvey (who also did the arrangements). James Boswell, best known as the biographer of Dr Samuel Johnson, kept a daily diary between the years 1762 and 1763; this account of a very different London to today, as seen through the eyes of a 22 year old Scot, provides the inspiration for the album. Boswell’s London Journal includes a piece entitled London, evoking Boswell’s arrival at Highgate Hill and his first view of the capital city. The Meeting commemorates Boswell’s not entirely successful first encounter with Dr Johnson on 16 May 1763. Friendship flourished however, and High Exultation documents the evening of 25 June 1763 on which Boswell and Dr Johnson wine, dine and discuss such things as ghosts, poetry, fathers and sons, and going abroad; Boswell retiring home ‘in high exultation’. Greenwich Excursion was inspired by Boswell and Johnson’s boat trip down the Thames to Greenwich; Most Miserably Melancholy charts one of the author’s recurring bouts of depression. Boswell’s London Journal offers an emotionally charged landscape that amply illustrates the human condition, from the low and the vulgar to profound conversations with Samuel Johnson; the real-life incidents in the London Journal offered the composers a wealth of rich material for the album’s 15 original tunes. …talented trumpeter, Chris Hodgkins, who plays in the unfashionable classic style of Ruby Braff and the great Louis Armstrong… this is his best album yet… a tuneful tribute to Dr Johnson’s biographer, craftily arranged and gracefully played. Jack Massarik, Evening Standard, Jazz CD of the Week, 5th December 2008. BOSWELL’S LONDON JOURNAL is a real pleasure — and I am not speaking as a still-active professor of English, but as a jazz listener. I admire Chris’s awareness of his emotional and spiritual roots in the literary / cultural past, and his joyful audacity. The first track on the CD, THE MACHINE, describes a stagecoach ride taken by Boswell. Chris’s original lines fall somewhere in between the twelve-bar blues and OLE MISS, and the sound of the band perplexed me — light, airy, yet serious — until I recalled its analogue: Buck Clayton’s Big Four for HRS in 1946: trumpet, clarinet, electric guitar, and bass (Scoville Brown, Tiny Grimes, and Sid Weiss, if I recall correctly). What follows is not exactly program music: had I lost the liner notes explaining what each composition referred to, I would have still enjoyed the music — but knowing the artistic structure underneath made this a much-more-than-usually pleasing musical travelogue, veering here and there from updated Thirties rhythm ballads to hints of Horace Silver and Hank Mobley as well as very hip film soundtracks and Sixties pop of the highest order (AUCHINLECK). I don’t know if I would have guessed the subtext of the winding, pensive REPENT IN LEISURE (referring to Boswell’s having caught gonorrhoea), but the historical / musical connection works for me. It is great fun to listen to the music on this disc — full of feeling, subtlety, and charm — whether reading the notes at the same time or as an after-commentary. Chris Hodgkins is a fine trumpet player, small-group leader, and composer; he has good taste in his musical friends and in the music he chooses to play. As a professor of mine used to say over thirty years ago, “I commend him to you”. Michael Steinman, https://www.jazzlives.wordpress.com/, 22nd January 2011. Played with polished urbanity …….the format gives shape to a civilised, middle-of-the-road jazz entertainment and makes for erudite liner notes. Beginning to CD Light, The Jazz Rag, Spring 2009. There’s an engaging quality to these compositions………..he pulls out some pleasing ideas….Brittain an underrated player, chords sympathetically and produces short but potent solos over Rayner’s walking bass. McLoughlin has a nice grainy sound on alto and is adept on soprano,too.There’s plenty of compositional muscle here. Peter Vacher Jazzwise, February 2009. This the best and most ambitious of Chris’s three albums for Bell……..The playing style is straight ahead swing in the tradition of the Ellington small groups……. It is apparent that careful thought and preparation preceding the making of this enterprising album and it pays off….The amusing and enlightening notes by English literature scholar and and Chris’s erstwhile drummer from his Cardiff days, Terry Hawkes are a considerable bonus. Bob Weir, Jazz Journal, February 2009.